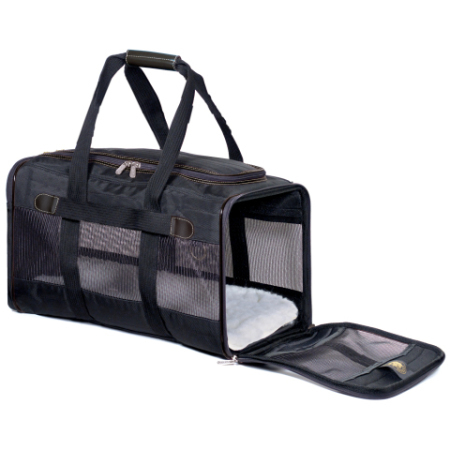 Looking for an excellent pet carrier for your dog or cat? It's easy to understand why the Sherpa Original Deluxe is a top-selling pet carrier on Amazon.com: Sherpa has thought of everything. Everything and everyone. You, your pet, her safety in the car and on an airplane... Convenience, comfort, and safety is what Sherpa is all about. Don't believe me? 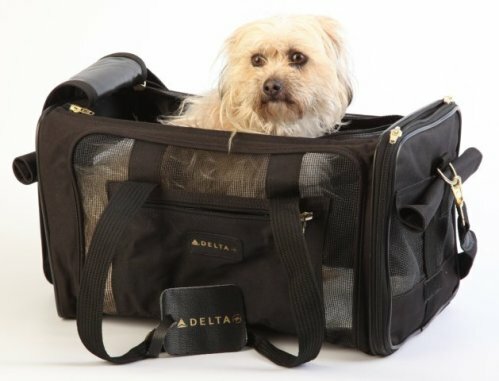 Sherpa pet carriers are the only ones guaranteed to be accepted on most major U.S. airlines. But for us land lovers, there are even more reasons to own the Sherpa Original Deluxe pet carrier and the Safety Suite. The first thing I noticed about the Sherpa Original Deluxe was how light it was compared to my cat's hard plastic carrier. It's only about a pound lighter, but the Deluxe is a few inches taller and longer than the medium size hard carrier I have. The Deluxe's nylon casing certainly lightens the load, but the case is very sturdily built with padded ripstop nylon and mesh. The Deluxe frame is flexible, but doesn't fold, so it feels very sturdy. With pet owner in mind, the Deluxe provides padded handles, which can also fit over your shoulder, and a set of longer no-slip shoulder straps for your convenience. There's even a Sherpa version of the carrier that comes with wheels! 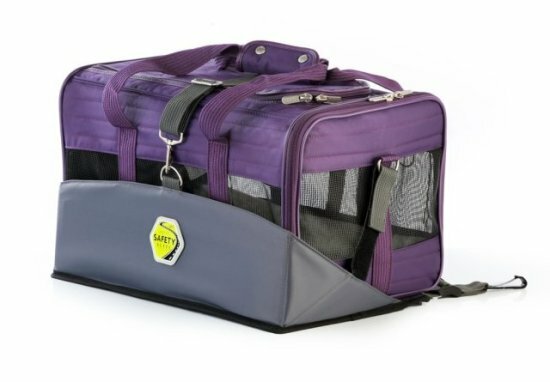 I have to load my cat from the top of a carrier and I appreciate the fact that the Deluxe offers the option of side and top entry; both entries have locking zipper closures. Moving a dog or cat around in a hard carrier is disconcerting to them, if not just plain scary. They are jostled around, no matter how hard you try to keep them steady, and that's no fun. But jostle them around gently in the Sherpa Original Deluxe and it's no biggie. There's enough give in the Deluxe carrier to keep them from getting 'rattled' while keeping them from getting hurt. Plus, they can see out of all sides and the top of the carrier, so they know what's going on. Sherpa carriers are assured transport on most major airlines. 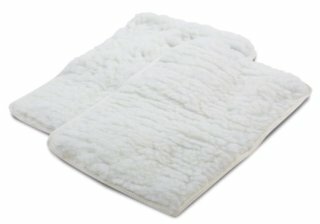 Sherpa Replacement Liners for Sherpa Original Deluxe pet carriersI think the part of the Deluxe carrier my cat loves best is the soft faux lambskin rug, Velcro-fastened to a hard-surfaced liner. He can lie down in comfort and scratch his rug at the same time. Going to the vet last week was a whole different experience for him (and me!) He normally yowls plaintively for 30 or so miles and, just when he's quieted down, we arrive, and the waiting room, full of other scared cats and dogs, evokes more yowling. I credit my kitty's new Sherpa Original Deluxe carrier for keeping him mostly quiet during that most recent visit to the vet. He was comfortable. His carrier felt like his own bed at home. The Deluxe comes in three sizes: Small (up to 8 pounds), Medium (up to 16 pounds) and Large (up to 22 pounds). Amazon.com sells all three sizes in a variety of colors. The Sherpa Safety Suite provides a perfect fit for any size Original Deluxe carrier in your car's back seat. It fastens right onto the car buckles most often used for infant seats. (See first image above for a side-view of the Safety Suite with carrier.) The padded Suite surrounds a small, medium, or large Deluxe carrier and fastens to it on both sides and over the top of the carrier. The hold is secure and every link on both the Safety Suite and carrier are solid and secure. 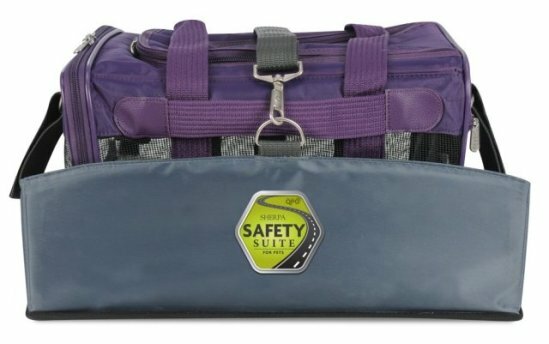 The Safety Suite accommodates other carriers as well as the Original Deluxe. I prefer it to using a carrier attachment to a safety belt, as safety belts allow more movement of the carrier than the fasteners installed for baby seats. But child safety seat buckles are not uniformly installed in cars before 2004, so attachment to your car's safety belt is definitely preferable to not attaching the carrier to anything! 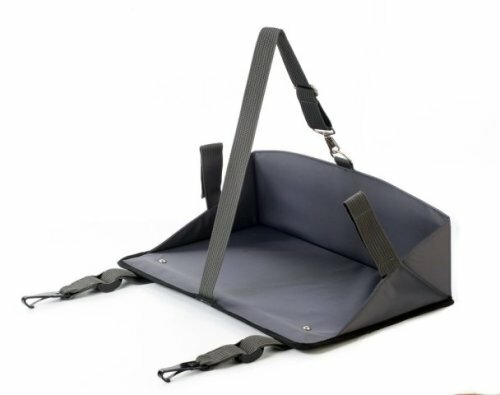 When not in use, the medium-gray Safety Suite folds up flat to the back of the seat, so a human can back seat drive without having to remove the Suite. Sherpa's Original Deluxe Pet Carrier and the Sherpa Safety Suite are top quality products and I heartily endorse them. Sherpa really does consider everyone and everything. 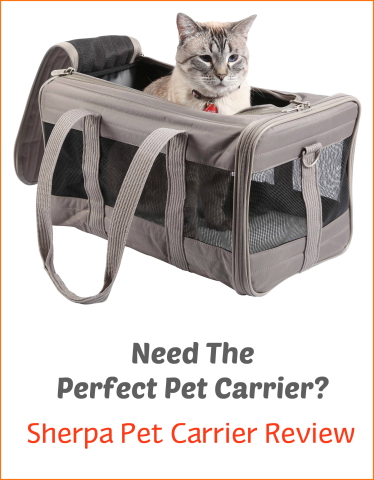 So when you are looking for the perfect pet carrier for your dog or cat, the Sherpa line is definitely worth considering.